I used a gauzy textured linen that I bought at Textile-o-phile in Colorado Springs last year (when I met Adriana!). It is a bit sheer, you can see my dark jeans through the shirt in these photos, so I'll need to be mindful of that, maybe choose lighter pants. I finished the seams as French seams or with bias binding. Instead of making my own drawstring with the fashion fabric, I used white twill tape. 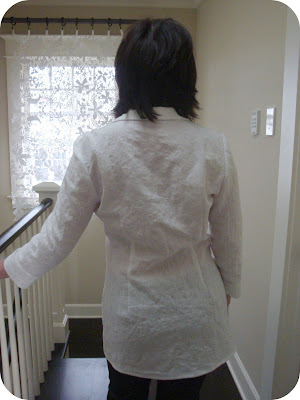 The magazine photo shows a white blouse made with dark contrast stitching. I didn't intend to use contrast stitching on my blouse, until I found out very early in construction that I had run out of white thread! Instead of making a trip to the fabric store, I proceeded with grey thread. It's hardly noticeable in these (very grainy - sorry!) pictures. As I mentioned before, this pattern is unusual in that the front yoke and undercollar are cut as one piece. It's not noticeable to others when you are wearing the garment, but if you are up for a new challenge you will enjoy this. And really, "challenge" is a strong word relative to prior conundrums I've had with BWOF. In this case, if you just follow the instructions step by step, everything will go together nicely. At this point, the undercollar is completely attached to the shirt. Now you attach the upper collar, but it has a shape that's a bit different than normal. Before attaching the upper collar, you'll want to finish the edges of those two rectangle shaped that jut out (the instructions don't tell you this). 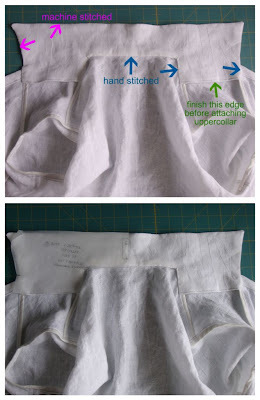 The upper collar is placed right sides together with the undercollar and stitched together along the long side and the two short sides. Once it's turned right side out, the remaining raw edges are turned under and the upper collar is hand stitched to the under collar at the neck seam and tacked to the yoke SAs. 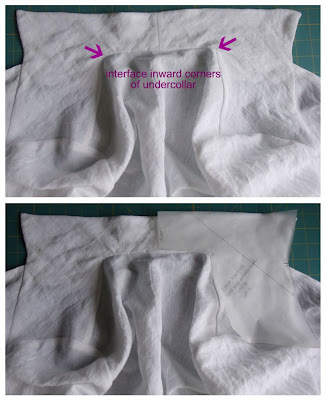 BWOF tells you to interface the upper collar, but it would also be wise to apply a small square of interfacing to matchpoint #2 on piece 2 (the front yoke/undercollar piece) as this corner is under some stress. 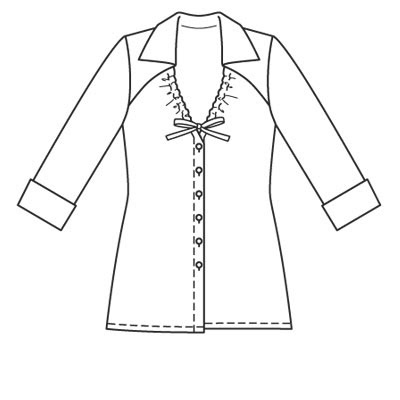 The gathers at the v-neck replace the bust darts you would normally find in this style of blouse. The depth of the v-neck can be controlled by how tight you pull the drawstrings (within limits). Very comfortable blouse, I'm really pleased with how it turned out and I wouldn't hesitate to make it again. That is so cute! I was looking at that today debating whether to make it or not. I think it will go on the to-do list. That is an adorable top...definitely a must sew! Very cute! I'm tracing this tonight, actually. I like your haircut, too (new? ), with all the flippy layers. The blouse looks great on you. It is on my todo list. Thank you for that tutorial on it, because I am sure I will need it. I LOVE this blouse! We are three months behind on BWOF in Australia. I will be making this blouse as soon as I get the pattern so thanks for the tips on construction. Wowsa! I have seen this around the internet as a favored pick from the March issue but didn't understand the collar love. Now seeing your beautiful version of this...I get it! What a beautiful top you've fashioned!! That's a perfect shirt for spring! I love the gathered neckline. I am always looking for an interesting neckline, love this one. It looks fab on you, well done. Very pretty. The collar is interesting. It's always fun to learn a new technique. Oh, that's great. It's a nice mix between tunic and blouse! Perfect in white. It looks very good on you. You can also roll up the sleeves, tuck in jeans, and have a completely new look! That is a super cute top, and I am impressed month, after month, how you always sew something from the current issue. BWOF is so clever, I love the collar. That was quick! I haven't even got my March Burda yet ;( Very cute on you. Nice blouse! I have my eye on this pattern so it's nice to see it made up. I was worried the neckline may be very low but your blouse reassures me it isn't. Very cute top - the neckline looks pretty modest by BWOF standards! The collar construction looks really interesting - one to put on my list for sure. Cute top - I love the fabric you chose to make this up -I will look out for this one! 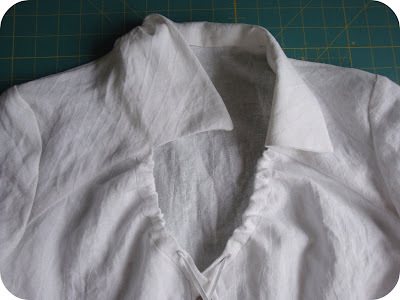 I love the neckline on this blouse...and gauzy linen is the best. Thanks for the construction photos...very handy. This looks so good on you! You matched fabric to design so well. Great spring and summer tunic. I'm actually making this blouse now! Got up to just after sewing the collar on over the weekend, but I haven't sewn down the outer collar to the shirt yet, so your tips are very timely. Thanks! ooh clap clap! I love the fabric you used here, it's so summery (and I wish my hair did that cute feathery thing you've got going on at the top! Mine goes asymmetrical when short, argh). Bonus points for adding diagrams to Burda's WTF instructions, too! The blouse is beautiful, great job. Thank you for showing the undercollar details. Wow, you're fast! Cute looking top! Thanks for the construction tips too. That is a really nice top and you did a great job putting it together! I bet you get a lot of use from this shirt! Your blouse is beautiful. The pattern is on my cutting table now so I was thrilled to find your post with pictures. This is so cute! I imagine a lot more people will make this up. Great idea to use the twill tape. Great blouse. I've got this on the cutting board. Thanks for the hints and I'm glad it turns out so well. Well, that sure was quick! I've barely finished tracing this one. I really like it. I didn't realize that about the collar - very unique. The blouse turned out beautifully! And now that I see a "challenge" in it, my interest just doubled, lol! I have one more question about this blouse-- I'm a little stumped as to how these sleeve cuffs are supposed to work! I'll probably just end up winging it, but if you have any suggestions as to how to get them to work without just sewing the hemline to the outside of the sleeve at the fold, I'd love to hear them. (This is my first BWOF pattern, so I haven't quite gotten the hang of the lack of instructions yet!) Thanks! Becky - Sure I can do this. It might take me a few days though, if you want a faster reply, email me (my address is on the right hand side). That came out great. Thanks for the pictures and tips. This is the first FO of this pattern I've seen so far. You did an amazing job. It looks great on you! Thanks for all the tips--now I'm really excited to make this one! Love your version of this top! Everyone is having such great success with styling this pattern. I'm very impressed by that collar! The shirt looks great. Congratulations! Very sharp, love the neckline! Hi, your top looks so great! The color, how it fits you, the fabric you chose. I'm not really up to a challenge, but I really want to make this shirt, I love the style on the front. BWOF pattern instructions always give me "What the H...do they mean?" moments, but I can't stop buying the magazine... well I had not bought that one, and I regretted it when I saw your top...So I went on a quest to find this issue...I found it, I already traced it, cut my fabric, did the interfacing, and marked the darts...so tomorrow night I will be ready to sew. I just have one question about your instructions: what does CB stand for? English is not my first language, and I'm learning sewing by myself, through trial and error... from online tutorials and blogs like yours. I don't know what CB stands for! THank you again for your instructions and for your answer, if you have the time. Chantal. Hi Chantal - I'm glad you were able to find the magazine! "CB" stands for "center back". Feel free to email me if you have any more questions - my address is on the right side.